Sebastien Saavedra finished the 2014 IndyCar series Driver’s Championship in 21st place, only finishing in the top ten once this year. We’ll be doing a statistical breakdown of all of the drivers who ran in the 2014 IndyCar season, starting from the back of the points standings and ending with the championship winner, Will Power. To view all of the driver breakdowns, click here. 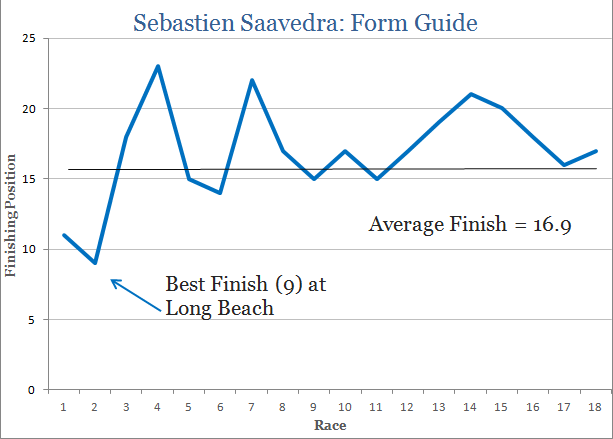 Sebastien Saavedra had a season to forget in 2014, never finishing a race above ninth. Saavedra did achieve one pole position start this year, which came at the Indianapolis G.P. (which he would crash out of on lap one). His best result came at Long Beach where he was able to put his KVAFS racing machine into the top ten and lead three lap during the race. Birmingham was the only other track where he was able to lead laps in 2014 (14 in total). Crashing and mechanical failures were both big troubles for the Colombian. He crashed out in two of the races in 2014 and had mechanical failures in another three. All but one of these DNF’s saw him finish outside of the top 20, causing him to lose valuable points. Sebastien Saavedra has no official plans or drive for 2015 yet, but his future in IndyCar is questionable after finishing outside 20th in the standings for the fifth year in a row. Three promising young drivers, Adderly Fong, Roy Nissany, and Esteban Ocon, took part in a two day test in Valencia, Spain to test out the Lotus and Sauber F1 cars. Fong and Nissany both did 99 laps in the Sauber C31 around the F1 circuit this week. Fong has raced in championships in both Europe and Asia, this year focusing on the Audi R8 LMS cup. “I really want to thank Sauber and Ferrari for providing me such a good package today,” he added. Alan Permane, Lotus’ operations director, said Ocon, “drove exceptionally well over the course of the last two days, completing every task we asked of him. Hulkenberg is currently eighth in the drivers championship and is within striking distance of Jenson Button. The German is having his best season to date with Sahara Force India, scoring points in all but three of the Grand Prix’s this year. “He’s a true racer and he knows how to motivate the team,” he added. 2015 will be Nico’s fourth year at Force India, racing with the team in 2011, ’12 and ’14 so far. Hulkenberg moved over to Sauber in 2013 only to finish with a disappointing 51 points. Force India currently sits 20 points out from McLaren in the constructor’s championship with three races left. Pirelli, the tire supplier for Formula One, has changed their tire choices for the Grand Prix in Brazil after the Sao Paulo circuit was resurfaced. The compounds available for the 18th round will be the soft and medium compounds, originally the medium and hard sets were going to be used. This decision comes after a heavily criticized Russian Grand Prix that saw Nico Rosberg do 52 laps on one set of medium tires. “After further technical analysis of the impact of the revised circuit surface, together with a risk assessment suggesting a low probability of compounding overheating due to extreme track temperatures,” the change was issued. The decision was made “with the unanimous agreement of all 11 teams,” he added. There are just three races left in the 2014 Formula 1 season, which leaves a maximum of 100 points left for any one driver to claim. Lewis Hamilton, Nico Rosberg, and Daniel Ricciardo are the only three drivers left in the championship running. Valtteri Bottas sits in P4 but is 42 points out from being able to contend for the championship. Hamilton is the current leader with a 17 point gap to his teammate, Rosberg. It has been a late season run for Hamilton, winning the last four races and overtaking his Mercedes partner for the points lead at Singapore. This was largely due to Rosberg’s DNF there as well as a fantastic drive himself. 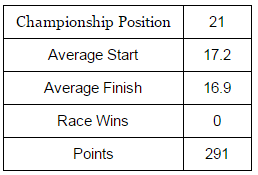 Since Singapore, there have been two more silver arrow one-twos to add on to the already dominant season. With that lockout at Sochi, Mercedes F1 clinched the Constructor’s Championship with three races to go. This is the first time Mercedes AMG has won this title in their time in modern1 Formula 1. If Rosberg hopes to secure his first Driver’s Championship this year, he’ll need near flawless appearances in the final three races. If Mercedes continue their one-two finishes in the final three races, Rosberg will need to win all of them in order to secure the championship win. But that task (obviously) isn’t going to be easy. Hamilton is on a run of good form this year and he is showing no signs of slowing down. Between his dominance in qualifying and race performance, it’s going to take a DNF or Hamilton screw up for Rosberg to have a shot. Ricciardo also needs Mercedes finishes outside the top ten in all of the remaining races for a shot at the title. Hamilton, Rosberg, and Ricciardo are the only drivers mathematically eligible to win the 2014 Championship. 1. Mercedes has been involved in racing since the 1900’s, but weren’t a full time constructor until 2010. The team was an engine supplier throughout the 90’s and early 2000’s to Sauber and McLaren. Nico Rosberg scored the team’s first win in their return to F1 in 2012 at the Chinese Grand Prix.